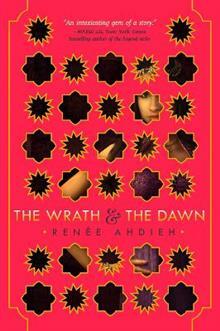 In book club in term 3 we’ve read The Wrath and the Dawn, by Renee Ahdieh, which we finished over the holidays. For months, the King of Khorasan has killed his new wife every dawn. No one knows the reason, but when Shahrzad’s best friend falls victim to a silk cord around her throat, she volunteers to be the next wife to seek revenge. She distracts the young King with stories and tales until each dawn breaks. Though after a few weeks living in luxury and curiosity, she begins to uncover the secret to the murders and finds herself falling for the young King. It was exciting and suspenseful. We liked that it was set in an exotic place, an Arabic country somewhere. And we liked the main characters. The end really makes you feel like reading the next book. But we found this book difficult to follow because of the names of the characters, often impossible to pronounce. Also, as the plot is obviously based on “The Thousand and One Night”, we might have expected more allusions to these richly woven and imbricate fables, yet only a couple of tales are told within the story.